The US government is at least partially responsible for the emergency, which is affecting millions of what are effectively second-class US citizens. The debt crisis, which has spurred comparisons to Argentina, Detroit, and, of course, the recent tumultuous events in Greece, occurs at the climax of a local recession that began in 2006, two years before the Great Recession, and is accompanied by other bad news. Because of the government’s shrinking tax base and huge debt-service expense, a sales tax of 11.5 percent—higher than in any state in the Union—has been imposed. Hundreds of schools are closing, and more than 31,000 jobs have been lost since García Padilla took office two and a half years ago. A healthcare crisis is looming because of a proposed cut of $150 million in Medicare Advantage reimbursements. The unemployment rate, now more than 13 percent, is bad, but it pales in comparison to a dismal workforce participation rate of around 40 percent—far worse than the US rate, which is itself at a 38-year low of 62.6 percent. As a result, the island is in the throes of a persistent depopulation, with about 200,000 migrating to the mainland over the past decade. What Puerto Rico has in common with Greece is that it is a peripheral economy that has been invaded by hedge funds and pushed, by speculation and ballooning debt-service payments, to its limits. But since Puerto Rico’s banks are tied to the US Federal Reserve and not its own government, there is no bank panic. What it has in common with Detroit is a history of inefficient administrations that borrowed to pay for pension payments and services, but, unlike municipalities in the 50 states, Puerto Rico cannot declare bankruptcy. Its territorial status also made its bonds triple-tax-exempt for any buyer, adding to the lure of their high yield and fueling the desires of an erratic muni bond market for paper that would quickly become junk. García Padilla’s announcement came about a year after he passed a law to restructure the debt, which was struck down in court in February (on Tuesday the Court of Appeals for the First Circuit in Boston upheld the decision on appeal, citing a 1984 decision by Congress that excludes US territories from Chapter 9 bankruptcy protection). He simply came to the conclusion that with zero economic growth and a debt-to-GNP ratio of about 100 percent, the situation was untenable. “This is not politics, this is math,” he said. The moderate mainstream holds that the island’s only recourse—a path that is supported by presidential candidates like Democrats Hillary Clinton and Martin O’Malley, independent Bernie Sanders, and Republican Jeb Bush—is to petition Congress to change the bankruptcy laws so that Puerto Rico would be allowed to file. But even if bankruptcy protection were granted, it would most likely entail painful austerity measures. The recommendations of last week’s Krueger Report, “Puerto Rico: A Way Forward,” commissioned by Puerto Rico’s government and put together by several current and former IMF employees, are clearly along those lines. Among other things, the report recommended shrinking the size of the government, lowering the minimum wage, and trimming federal entitlements—including Medicaid and Medicare, which would be a particularly dire step, since 2 million people, or roughly 60 percent of Puerto Rico’s residents, depend on those programs. The report also recommended making it more difficult to get overtime pay—on the same week that President Obama expanded it for US mainland workers. 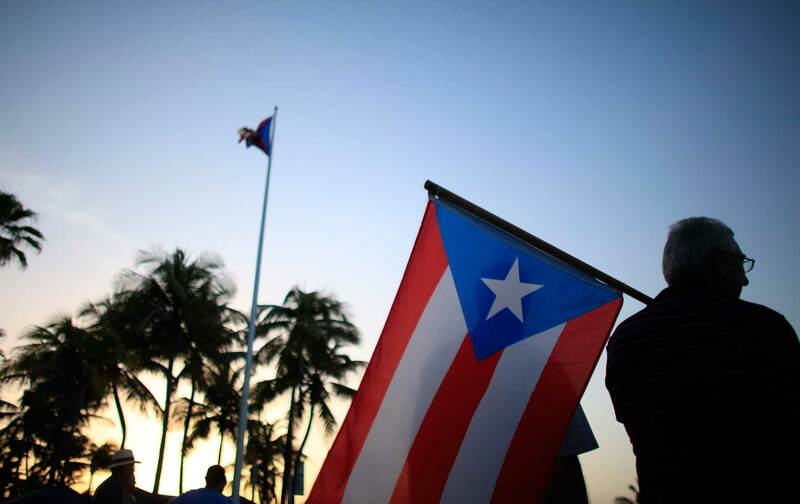 For its part, the Obama administration is saying that no bailout is being contemplated, although it is urging Congress to consider changing the law to allow Puerto Rico to declare bankruptcy. Last February, Pedro Pierluisi, the resident commissioner of Puerto Rico, who is the island’s non-voting representative in Congress and a member of both the pro-statehood party and the US Democratic Party, introduced HR 870, which would accomplish that. The bill has not made much progress, however; the latest action was in March, when it was referred to the Subcommittee on Regulatory Reform, Commercial and Antitrust Law. Most House Republicans are against the measure, considering it a bailout, despite the fact that most of Puerto Rico’s pro-statehood party is affiliated with the GOP, most notably Alaska’s Don Young. In his telecast speech on June 30, García Padilla said he was not in favor of lowering wages, but he also said he would push for “legislation to make our laws more competitive” to promote job creation, which is code for doing just that. What many left-leaning Puerto Rican economists and political theorists are saying is that they agree, as the Krueger Report says, that the island’s economy has deep structural problems. It’s the report’s remedy that they disagree with, especially when it’s been shown that austerity in times of recession tends to depress economies further. Working People’s Party spokesperson and University of Puerto Rico professor Rafael Bernabe supports a recent legislative proposal to audit the debt, as was done in Greece, where that process called the imposition of the debt “premeditated” and “immoral.” In fact, Puerto Rico has become the victim of a high-stakes game of hedge-fund casino gambling, with about 43 percent of the debt held by so-called vulture funds and Wall Street banks and lawyers charging over $1.4 billion in a seven-year period between 2006 and 2013 for charges like swap termination fees. “We want to study the general conditions that led to the creation of the debt, the terms of the contracts, the role of intermediaries,” said Bernabe in an interview with The Nation. For the most part, the debt crisis has been portrayed as something that arose after the advent of the current ten-year recession. But in fact, Puerto Rico’s government has been borrowing to finance its expenses since the 1970s, when the limited success of the post–World War II Operation Bootstrap, which transformed its economy from an agricultural one to a light manufacturing one, lost its luster. The resulting cure, Section 936 of the IRS code, exempted US and multinational corporations from paying taxes on profits, but that spur to investment was phased out between 1996 and 2006. Meanwhile, NAFTA had already depressed wages in nearby Mexico, making Puerto Rican workers too high-priced, and a construction and infrastructure building boom that was partly financed by bond-selling had burst, driving the island’s economy into its current death spiral. It’s reasonable to ask whether the US government is at least partially responsible for the crisis—both through creation of the nebulous commonwealth status and the actions of its financial institutions—and whether it has a moral obligation to help resolve it through financial support. In 2004, legal scholar Pedro Malavet suggested that it was the social construction of Puerto Ricans as a non-white race that made them “unassimilable as Americans,” cementing their colonized status, and that they were therefore owed reparations. While the idea of asking for reparations may have lost its feasibility after the Great Recession, both the United States and the ruling party of Puerto Rico should begin to view the debt crisis as a human problem affecting millions of what are effectively second-class US citizens, and not a matter of business mathematics. If mainstream politics on the mainland refuses to consider a restructuring of the US economy away from a blind profit motive, it should at least have the intelligence and decency to help Puerto Rico restructure its own economy to create new modes of capital reinvestment on the island, just as it would anywhere on the mainland. Any movement for independence, which might choose to lobby for reparations, needs to highlight class, race, and gender marginalization, as well as environmental reform, as part of its agenda. 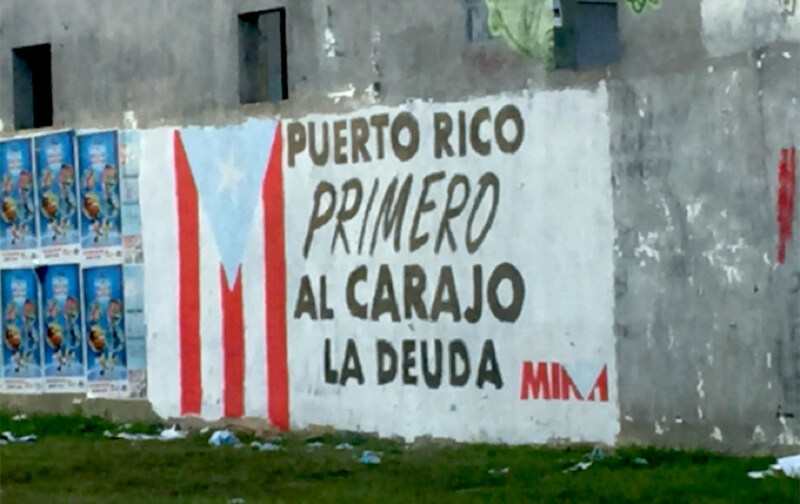 New parties that do not prioritize status change, such as All Puerto Ricans for Puerto Rico, the Sovereign Unity Movement, and the Working People’s Party have tried to enter the arena, but according to political scientist Manuel Almeida, “the rules of the game” in the island’s political structure have hindered their emergence. Puerto Rico’s ruling party has used technical challenges to delay the Working People’s Party’s re-certification for elections, despite electoral reform that had allowed the new parties to field candidates for the 2012 elections. With an overly moralistic tone directed at the island’s mostly Catholic residents, Governor García Padilla spoke of “shared sacrifices,” in which the community, supposedly complicit in the actions of an irresponsible government, would share the pain with the bondholders. But many Puerto Ricans I’ve spoken with, from academia to the working class, agree that they’ve sacrificed enough, and that it’s time for those most responsible for creating this mess to own up to their transgressions.